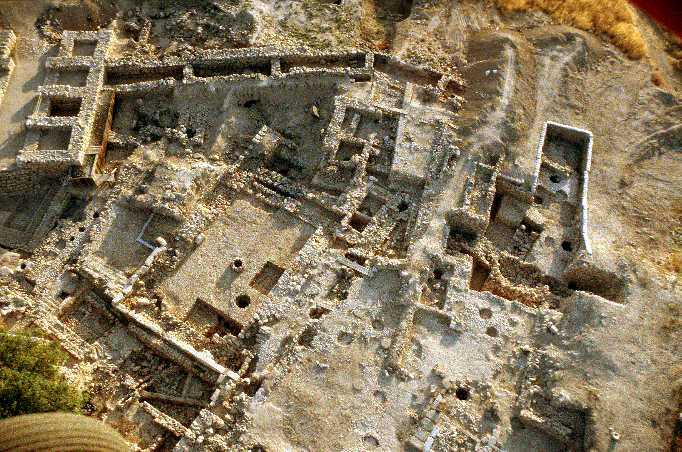 Hatzor, in the upper Galilee, was the largest Canaanite city in Israel. So large, in fact, covering 200 acres (10 times the size of Israelite Jerusalem), that scientists at first did not believe that all of it used to be a city. They thought it might have been a chariot park. But probes at different points proved that stone remains filled the whole area. Only during the first part of Hatzor's history was the city really great, from the 18th century to the 13th century BCE. Before that it had been a small town. In the Bible the full-grown Hatzor is called the "head of cities (Joshua 11:10)." It commanded a watering spot on an important crossroads along the trade route connecting Egypt with Mesopotamia. Hatzor is mentioned in several old texts from the ancient library in Syrian Mari. They reveal that it was a trade city, merchandized tin, and that Mesopotamia sent two ambassadors to it. Hatzor is also mentioned in Egyptian texts. Most of Canaan came under Pharaoh's rule at some point, but Hatzor had its own king, who ruled neighboring cities as well. The city suffered enemy attacks several times. According to archeological finds, the city was burnt in the 15th century, maybe by Egyptian Pharaoh Thutmose III, and in the 13th century BCE there was a complete destruction. This latter date corresponds with the information that is given in the Bible, that Hatzor was the only Canaanite city that the Israelites conquered by fire (Joshua 11:13). The Israelites first took on Jabin, the King of Hatzor, who had formed a coalition of Canaanite cities. The Israelite hero Joshua won the battle and burned and ravaged the city (Jos. 11:1 - 12). This story cannot be verified against other sources, however. The victory over the Canaanites seems amazing, as their civilization was of far superior level compared to the Israelites'. According to the Book of Judges, another battle took place, against Jabin's chief of staff, Sisera. The Israelites under Barak defeated him (Judges, Chapter 4). In any case, the Israelites then settled Hatzor anew, but only the upper city was used. At first they did not leave traces; they Israelites lived in tents or huts. King Solomon rebuilt Hatzor in the 10th century BCE (I Kings 9:15). However the Israelite city was destroyed again by the Arameans from Syria in 885 BCE. After that the Northern Israelite kings Ahab and Omri restored its glory, but soon an earthquake and the destruction of the Assyrians under their king, Tiglath-Pileser, in 732 BCE wrought complete havoc (II Kings 15:29). Hatzor became a part of the Assyrian empire which took hold of northern Israel, but it was only rebuilt as a stronghold, although sporadic buildings from Arabic times were found. Clearly a large city offers much to excavate. Many archeologists have been associated with Hatzor in the past, and some still work there now. Digs are being conducted each summer. So far, only a few probes have been opened up into full projects, the most impressive ones are in the upper city. All in all there are twenty-two occupation levels of superimposed cities (when one city was destroyed, a new city was built on top of it), starting from the 29th century BCE. 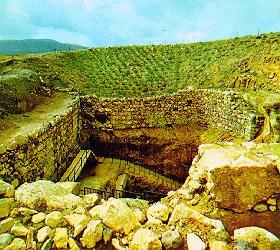 The great glacis (rampart) made of earth and the stone ditch which surrounded most of Hatzor are its oldest features. The lower city has a large Canaanite temple, with three rooms laid out in a row. Three older temples were found underneath it. They date from the 17th to the 14th centuries BCE. The entrance was guarded by stone lions. 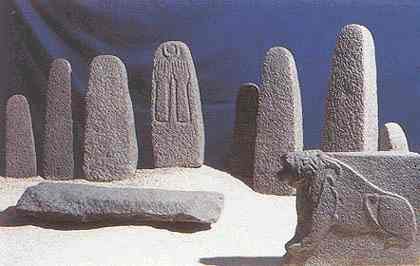 In the inner room stood a basalt altar. On one of its sides there is an inscription of a circle with a cross, the symbol of the Canaanite storm god. In the upper city, current excavations are busy digging to the Canaanite palace, and preserving and strengthening its walls so they won't collapse. Under the palace an older palace was disclosed. There are also two smaller temples, maybe for royal use, dated to the period of the oldest palace (17th or 16th century BCE); for some reason they became discarded later. In the south temple, cultic vessels, incense burners and heaps of animal bones were discovered. 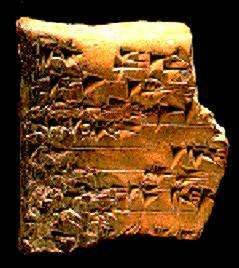 Several clay tablets with cuneiform inscriptions were found in the palace area as well; a recent letter which has not been deciphered yet was written to King Ibni of Hatzor in the 28th century BCE. Scientists hope to find a library of these tablets on the scale of other ancient libraries, which will disclose further details about Israel's earliest history. In the ash layer which covered the palace after Hatzor succumbed to enemy fire, bronze and ivory statues and jewelry were found. 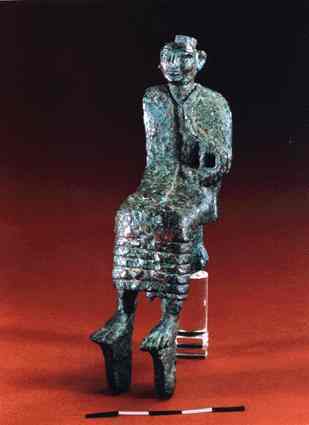 Among these was also a shattered 1-meter high statue, the largest statue that has been found of this period in Israel. The other remainders date from the Israelite period. One magnificent building is the gatehouse of King Solomon's, located near the deeperlying Canaanite palace. Copies of this gatehouse, with three chambers on each side, are found in Gezer and Megiddo. Facing to the outside two towers flanked the gate, which connected the double city wall. This wall was sometimes filled in, turning them into store rooms for grain, which happened during the Omrid period, when the city was extended. Outside of the gatehouse there are some Iron Age dwellings and a paved street. Partly these were built on rubble of the Canaanite palace. They date from the 9th/8th century. One of these has a large pillared courtyard, and a more recently excavated house has plastered walls which were preserved up to two meters high. Nearby there is the smaller house (two rooms plus court) of Mrs. Mahbiram's. Her name is known from an inscription on a pottery shard that was found in it. The gate probably led to the citadel in the southwest corner of the upper city. This was the location of the Omrid's fortress. Maybe Solomon built a fort or palace here too, but it is not mentioned in the Bible nor has archeology turned up any remains. However the double wall outside it belongs to Solomon's age. The fortress was square, and on the outside, a street passes, along other buildings. At the end of the street, to the right of the fort, stairs lead to the second floor of the fort. To the entrance of the street was a monumental entrance with beautifully carved capitals, one of the trademarks of Israelite royal architecture, copied from Syrian examples. In the eighth century BCE the threat of the upcoming Assyrian invasion inspired a fortification of the northwestern corner of the fortress section. A tower was built, of which the foundations can be seen, and the northern wall was redone. Also the other corner of the upper city was fortified in the same period. This was done by filling in the double wall and building two towers. A small postern gate was constructed to give access to the lower city, but by the Assyrians approach this was filled in too, with bricks, while the outside was camouflaged by natural stones, the same ones that were used in the wall. Also a second wall was built parallel to the old double wall. In the most southern point of the upper city there is an elaborate water system, built by king Ahab. The same system is used in the biblical city of Gezer. The 19 meter deep shaft, and the stepped tunnel which leads another 25 meters down to a carved aquifer at water level in the hill, was a preparation against an expected Assyrian siege. The entrance led down from a building with four rooms. The steps are wide enough for mules to walk down which carried the water on their back.